Afternoon all! I hope that you stayed warm and dry over this past dismal weekend, if you’re in the UK , and that if you’re elsewhere that the weather was a bit nicer for you. For me, there was nothing for it but to hole up and wait it out. I can cope with the cold, and with the rain, but I didn’t fancy getting blown away over the weekend! That said, it was all very restful and lovely. I had a bit of a stressful week last week, and the cold weather and everything was getting me down a bit. 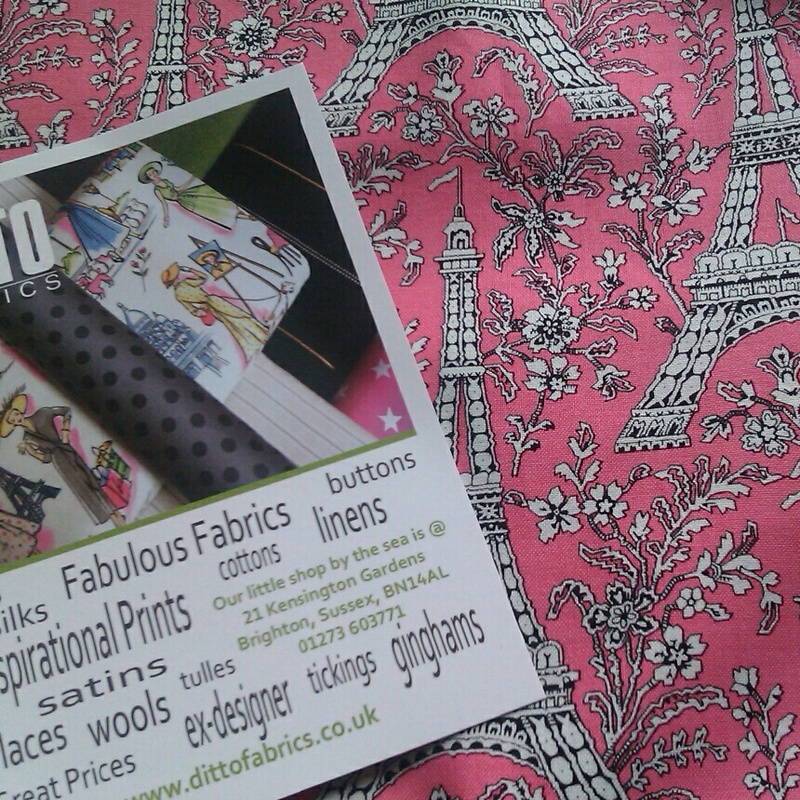 On Thursday I met my dear Louise for nachos and a chat at lunchtime, and after discussing Ditto Fabrics at lunch, I decided to treat myself to some Michael Miller Eiffel tower fabric when I got back to my desk. The afternoon was further saved by a lovely and inspiring meeting with my manager, and by Nic surprising me by meeting me at the office when the work day was over. It was so nice to break my routine slightly – instead of rushing for the train as I normally would, Nic and I went to pick a few things up in Ikea and took our time about getting home. I was working from home on Friday and, while I got through my to-do list, my fabric arrived from Ditto and it went straight into the washing machine. By the time I had finished for the day, it had been washed and dried and was ready to sew! Rain forced me to abandon plans to see my friend Lucy, so instead I sat myself down at the sewing machine and powered through another Colette Patterns Chantilly dress. Well, I didn’t sew it all on Friday afternoon – I did some on Saturday and some on Sunday as well, but it was a very enjoyable sewing session indeed. I’ll write it up as soon as I’ve worn it and photographed it, but it’s a beauty even if I do say so myself! After a week where I was feeling stressed and a bit low, the restorative nature of making really perked me up and made me feel like myself again. So, today being payday, I put in another Ditto order! 'I, Roisin, of It can’t be from Dolly Clackett… She gave me an Easter Egg! sign up as a participant of Me-Made-May '12. I endeavour to wear at least two handmade garments per week for the duration of May 2012. In addition, I pledge to have sewn at least two more garments by the end of May 2012"
This feels manageable and realistic to me, as well as being challenging. I wanted to add in the bit about sewing two more garments because I want to make sure I remember to sew even when life is stressing me out because it makes me feel better. May is going to be a busy month for me for lots of reasons, but I will have time to sew, and I’ll certainly have time to rock some me-made items! Even without the two new dresses I plan to sew, I have enough to get through the month with no repeats, I think. I’m looking forward to joining in! So, along with all of the sewing, the weekend was really really lovely. Nic and I had plans to see The Avengers with our friends A and H on Saturday afternoon, and then to go for dinner afterwards. The weather was frightful, but I thought I’d ignore it and wear a pretty dress anyway. I did wear a slip for warmth, though. Sailor dress of dreams! I love Stop Staring dresses, and I bought this one on ebay and then the weather turned horrible so it hasn’t had a proper outing yet. It’s marvellously impractical to wear; every time I put my coat on I had to get Nic to help me tuck the collar in. But still, I feel fabulous in this. I put tights on for sitting in the cinema later, though. I always get so cold in the cinema! I was unsure of what to expect of the film because I haven’t seen any of those other Marvel films. Not even Iron Man, isn’t that lame?! Also we were seeing it in 3D, and I am so sceptical of 3D. All reservations aside, I really enjoyed it – and despite having derided The Hulk that morning to Nic (“He’s basically like a less realistic Woof, isn’t he?”) I think I liked him best of all in the film. Mark Ruffalo was pretty great. After the film we went to Kayal for dinner and basically had to be rolled home, which was excellent. On Sunday we holed up in the flat to listen to the wind rattle the windowframes. I sewed, Nic read comics and listened to jazz and we watched lots of episodes of the first season of Law and Order, which Nic had brought home for us. Early on, that show was great, and I confess to being really tickled by how explicitly the title sequence spells out the show’s concept. Like, in case the title left you somehow unsure of what the show was about, it’s spelled out for you in the title sequence. My love for the music of Mike Post increased by about 300% as well – there’s no slacking off with Post, you can’t say the man doesn’t work hard. According to the Law and Order Wikipedia page, the chung chung sound that indicates a scene change was “an amalgamation of nearly a dozen sounds, including an actual gavel, a jail door slamming, and five hundred Japanese monks walking across a hardwood floor.” WELL PLAYED, POST. Nice work. So that’s about it for the weekend. I have another busy work week ahead but a lovely long weekend to look forward to, some sewing, and some wearing of me-mades! See you soon for the first installment, and my new dress!